(Nanowerk Spotlight) Probably the hottest new material system being researched at the moment, graphene consists of just a single atomic layer of carbon atoms bound into crystal lattice. This carbon material reveals many unique properties including extremely high electron mobility and thermal conductivity (see our Spotlight about the discovery of extremely high thermal conductivity). The most promising applications of graphene are in electronics (as transistors and interconnects), detectors (as sensor elements) and thermal management (as lateral heat spreaders). 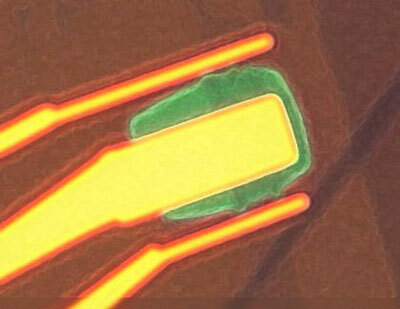 The first graphene field-effect transistors (FETs) – with both bottom and top gates – have already been demonstrated. At the same time, for any transistor to be useful for analog communication or digital applications, the level of the electronic low-frequency noise has to be decreased to an acceptable level. Low frequency electronic noise (also referred to as 1/f noise, where f is the frequency) dominates the noise spectrum to a frequency of about 100 kHz. Despite the fact that modern electronic devices such as cell phones and radars operate at a much higher carrier frequency, the low frequency noise is extremely important. Due to unavoidable non-linearities in devices and systems, the low frequency noise – also referred to as flicker noise – gets up-converted, and contributes to the phase noise of the system, thus limiting its performance. It is not possible to build a communication system or detector based on graphene devices until the noise spectral density is decreased to the level comparable with the conventional state-of-the-art transistors. The Nano-Device Laboratory research group of Alexander A. Balandin at the University of California - Riverside (UCR) has now reported the results of experimental investigation of the low-frequency noise in a double-gate graphene transistors. Balandin's team has designed and built single-layer graphene transistors with two gates: the back gate made of degenerately doped silicon wafer and the metallic top gate separated from the graphene device channel by HfO2 (a material recently introduced by semiconductor industry for conventional silicon transistors). The specific fabrication procedure for the advanced top-gated graphene transistors (see Figure 1) has been developed by Guanxiong Liu, a PhD graduate student in Balandin's group. The transistors have been tested at UCR and at Michal Shur's laboratory at Rensselaer Polytechnic Institute (RPI). The joint team, which included a noise expert Sergey Rumyantsev from the RPI and Ioffe Institute of the Russian Academy of Sciences, St. Petersburg, Russia, discovered that the low frequency noise in the top-gate graphene transistors originates from the charge carrier trapping by defects and can be reduced to the levels required for practical applications in communication systems and detectors (sensors). Very little has been known about the electronic low-frequency noise in graphene transistors. Essentially, nothing was known about the noise level in top-gated graphene transistors, which are more practical than the back-gated devices but usually suffer from reduced electron mobility. Moreover, the fact that graphene is just a single atomic layer of material, where surface dominates its properties, suggests that the noise level can be extremely high. 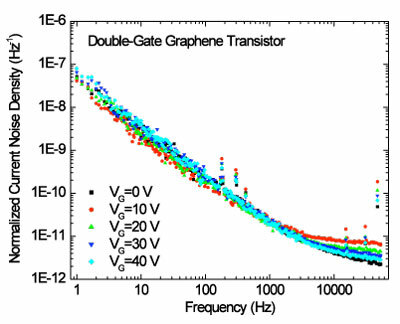 In this regard, the UCR–RPI discovery that the noise is rather low, and in properly designed and fabricated graphene transistors can be reduced down to the same levels as in conventional semiconductor devices, comes as a bit of surprise (see Figure 2). "We knew that the noise in carbon nanotube transistors was rather high and conventionally attributed to defects in the substrates and impurities on nanotubes surfaces," Balandin explains to Nanowerk. "So we were very encouraged by the measurement results, which have shown that even in the top-gate graphene transistors, where the graphene channel is embedded between two oxide layers, the low-frequency noise is low." He notes that the motivation for this work was the need to prove that nanoelectronic graphene devices can be used both in digital circuits and communication systems. The work was carried out within the framework of the Functional Engineered Nano Architectonics (FENA) center and the Interconnect Focus Center (IFC) – two of several U.S. government?industry funded consortia tasked to look at possible future electronic materials and technologies. The results of this UCR ? RPI collaborative research will be published in the July issue of Applied Physics Letters. The low-frequency noise in conventional transistors is characterized by a figure-of-merit conventionally known as Hooge parameter. Although there are still a lot of debates about the origin of low-frequency noise and physical limits of applicability of the Hooge parameter, it is the only quantification that is provided in most scientific papers on noise. In conventional materials, the Hooge parameter is on the order of 10-5 to 10-3. "What we have shown in collaboration with RPI is that in graphene transistors the Hooge parameter is rather low" says Balandin. "It is on the order of 10-4 to 10-2. From the gate bias dependence and presence of characteristic generation-recombination (GR) peaks in the noise spectra we also found that it is dominated by fluctuations in the charge carrier density due to their trapping and de-trapping by defects." Balandin explains that this means that the noise level can be reduced even further with improvements in graphene device fabrication technology. "The is a crucial requirement for all proposed communication, digital and sensor applications of graphene" he says. The team now plans to examine other graphene transistor designs and fabrication technologies to reduce the noise even further and make graphene devices more stable.